A postcard view of one of Sargent’s Follies in Franklin Park. Image via the Dorchester Historical Society. 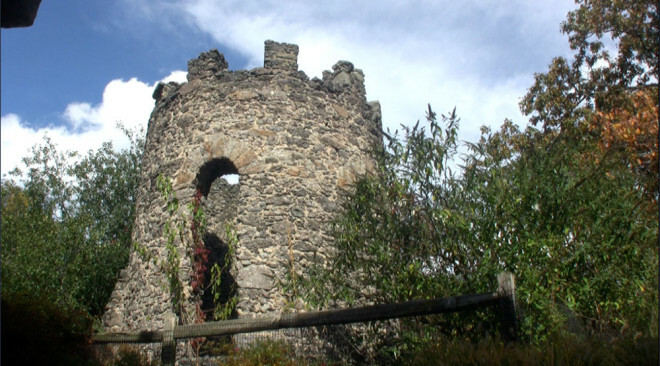 Inside the Zoo at Franklin Park are two stone towers known as Sargent’s Follies. They look like crumbling remnants of medieval forts, tall and round and slightly menacing. These two towers are the only structures that remain from the farms that were overtaken by Olmsted in the 1880s to make the Park. 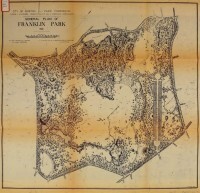 Olmsted’s Revised Plan of Franklin Park. Note that The Greeting is the long promenade on the right side of the map, and is the current site of the Zoo. Follies were a popular form of landscape decoration in the 18th and early 19th centuries, especially in Europe. By adding a ruin of a castle or tower, the wealthy could evoke a long familial history with the country of old, and imply that they were descendants of great lines of kings and warriors. Of course, American history is much shorter and follies were less popular here, but that didn’t stop Lucius Manlius Sargent from building two towers in Roxbury in the early 19th century, where they still stand today. A view of the same same folly in October 2012. 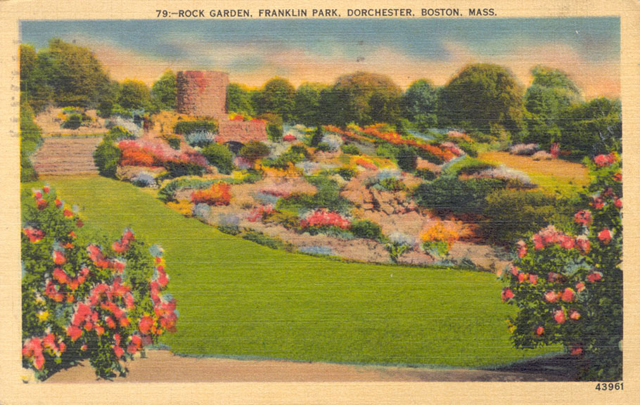 Like many of the features of Franklin Park, the follies were popular tourist sites and postcards were made of them. The taller of the two towers stood alone on a small hill, and the wider tower was surrounded by Olmsted’s crew with a glorious botanical and rock garden. In this way, each folly was incorporated into the Park-Ante that Olmsted envisioned for the northeastern side of the landscape. In his original and revised plans, Olmsted has set aside much of this area for The Greeting, a promenade leading to the Playstead. Inside the Greeting, each folly is given a place of importance and set aside for visitors. The Greeting was never built as Olmsted intended and, under his son’s direction, became the Zoo which continues to occupy the site. I have much to say about the Zoo and its maintenance (or lack thereof) of the Olmsted-era structures within its boundaries, but the follies are the most heartbreaking for me. I can understand why many of the original buildings, built at the end of the 19th century, would need to be torn down. Even the Bird’s World House, the one remaining original building, is obviously showing its age. So, sad as it is, I’m sympathetic to a Zoo administration that is underfunded and looking at collapsing buildings thinking it best to tear them down. With the follies, however, I’m disheartened because I can see that the Zoo is missing a great opportunity. What is now clearly treated with disdain, or at least considered an inconvenience, could become a great benefit to the Zoo. 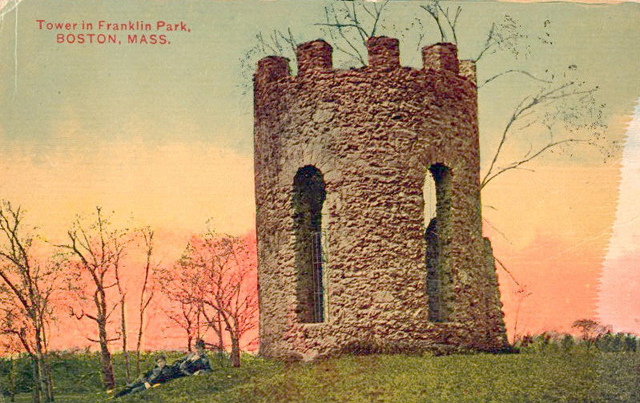 A postcard view of the other Folly in Franklin Park. Image via the Dorchester Historical Society. The same folly viewed in 2012 , possibly from the same angle as the postcard. First, let me explain the experience of visiting the follies this past summer. One tower, the taller one, is on its small grassy knoll that now abuts the lion and tiger cages. A visitor takes a winding path to view the large cats and emerges into an open space, where other animal pens are visible ahead. The folly is crammed against the wall of the lion cages and hidden behind a tree. The whole structure is surrounded by construction fencing, with a small placard showing the old postcard image of the tower (the same as I’ve posted here). On the day I was there, not a single person stopped to look at it, except to wonder why I was shooting video of this ugly stone thing. The view of the tower folly that most people remember. Down the path a short distance, between the lion cages and the ape house is the second tower. This one you can’t even access, as it is on top of a hill surrounded by a fence and overgrown woods. What was once a glorious botanical garden is now just a tangle. If you weren’t looking for it, you’d never know that one of the oldest buildings in the park was nearby as it’s almost completely hidden. I know that it would cost money to rebuild the gardens around the smaller folly, and that the Zoo has financial troubles just keeping the place open, but wouldn’t a large garden with flowers and woodland animals also be a big attraction? I can’t wrap my head around how such interesting buildings with such a unique history can just sit ignored. On the Zoo’s map, the only reference to either folly is a small drawing of the one near the lion pen. It’s not even labelled! I wanted to highlight these two follies because they are really cool and reminiscent of a time in history when building random ruins on your property was popular. The next time you’re at the Zoo, take a few minutes to seek them out and imagine them in their original context, surrounded by gardens or alone on a hill… these Roxbury sentries. One of the neglected Sargent’s Follies. Read more meditations on Franklin Park here. 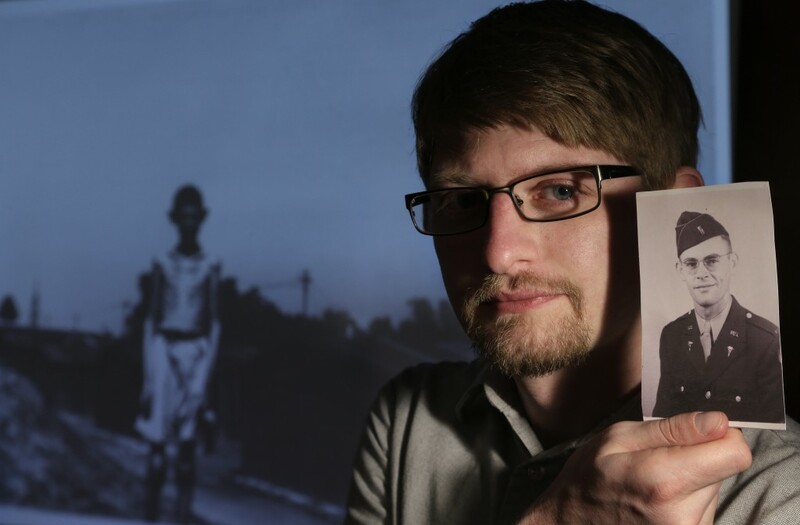 “16 Photographs At Ohrdruf” needs your support!